I grew up eating chicken salad. Not “Fancy” chicken salad, just good old chicken salad made with chicken, celery, egg, dill pickles and mayo and to this day, that’s the way I prefer mine. 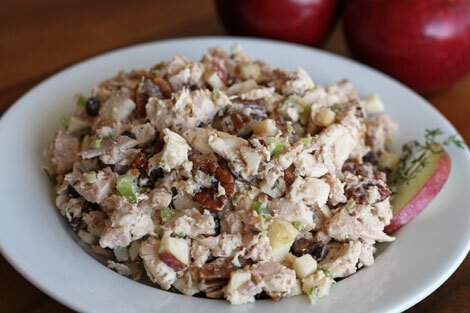 Over the years, I’ve made different versions of chicken salad for my customers and all have been a hit, but nothing like the response I get from this version of fruity chicken salad that I began calling “Fancy” chicken salad on our menu at work. Never put the chicken in a food processor, instead, tear it with your hands. We aren’t making cat food so it should resemble something from a can, which leads to the second note. Don’t use canned chicken. Take the time to boil some chicken. If you take a shortcut, it won’t taste the same. As for the chicken I use, any cut. But at work, because of what’s in inventory, it’s 95% of the time boneless, skinless breasts. NEVER under any circumstances, load the chicken salad with mayo. You want just enough to hold it together. How much is that? You’ll just have to see. I don’t put a measurement because it’s hard to say. It depends on the chicken, the size pieces your chicken is, the size you cut up the ingredients, etc. You can always add more mayo but you can’t take it out. That’s a good rule of thumb for any cooking! That’s it! Cook chicken and shred/dice in a large bowl. Cut apples into a small dice (leaving skins on) and add to the chicken. Add the celery and dried cranberries. Mix in mayo, just enough to hold all ingredients together. You don’t want it “swimming in mayo”. Toss in some nuts if you like (I do sometimes, don’t others. Depends on my mood and who I’m serving. A lot of people have nut allergies). Season with salt and pepper (this too is up to you and your taste buds.. add some, taste it, add more if you think it needs it). It’s great to eat on top of a green salad, made into a sandwich or wrap, or splurge and enjoy it on a buttery croissant!